They asked me to be Mary. I think it came more down to the fact that I was one of the few dark- haired girls, but the others were jealous anyway. All I really had to do was sit on the stage in some kind of a gown, behind the 'manger' and rock the baby every now and then. The village school was a Church of England School (I only recently realized I spent two years of my life saying a prayer every morning, without having any idea of what I was saying. ah the innocence of primary school ) so the annual nativity play was quite a show, even more so when you're five years old. Most winters in that part of Suffolk weren't too cold. Usually clear, bright winter sunshine, sharp wind off the North Sea, I managed in tights and black suede boots and somehow avoided wearing a winter hat. Still, I was a sickly kid, one of those who was perpetually out with an ear ache, a scary cough, on antibiotics, vaguely asthmatic. The year I was Mary it was a chest infection. I remember the burning pain, like my little ribs were a cage, a cage too small for the bird that was valiantly flapping its wings to escape. I coughed so hard my whole body shook, I couldn't leave my bed, my mum gave up going to work and read books with me, my dad stayed up all night watching The Wombles (does anyone else remember them?). This year it was a gray winter, there was no watery sunshine through milky clouds to dry out my damp lungs, that ever-present wind left people hurrying from house to car with scarves up to their ears, hands shoved deep in pockets. Those low hanging gray clouds were like the feathers of the doves that sat on our fence, cooing softly, like snowfall on a slate roof. My dad would look up at the skies and say "snow skies", my chest would burn, I'd hope he was right, I wanted a white Christmas, I spent another December afternoon at the doctor's office and coughing myself to sleep. The other girls were probably hoping that I'd be too sick to come in and play Mary. It was clear that I wouldn't be in the choir, singing Little Donkey and We Three Kings, but the teachers said I could just come in and sit on stage as planned. My grandparents plied me with marshmallows 'for strength', I wore the gown and sat behind the manger, the others sang about Bethlehem and yonder star. I wondered if it snowed there, if Mary had been able to cough on her donkey ride, whether yonder star was that brightness I saw from my bed when I lay awake at night, the white light that left little pools of silver in the puddles. It started to snow. I was back to school by the last week of term. Forced to wear a hat and scarf. I wasn't happy because it's not the kind of thing that princesses wore and jeez mum I am a princess. It was just a light flurry, airy white flakes, like the dusting of flour on country bread. I was sitting by the window, they were playing Christmas songs, I was making an ornament out of dried pasta and silver spray paint, then a chubby fairy. By the time it was break, the snow was gone, but it was like a promise. The skies were still dove gray, small puddles on the ground were freezing, I could feel the burn through my jacket. One morning it started in earnest. I dropped my cheese on toast to climb up onto the couch by my sister, to watch the fat flakes come down hard. It was like those American tv shows we watched, where they could build snowmen and throw snowballs. We went to school feeling light, cheery as the Christmas mantel. The adults murmured on the playground that we'd be home by lunch, the boiler was on its way out. Our dad came to pick us up and we told him our big plans. We needed a snowfort, to make snow angels, teach us how to throw a snowball. My mum provided the warm clothes and wrapped a woolly, musty scarf around my neck, gave dad explicit instructions that I wasn't to get wet. The doves sat on the roof of the garage and watched us. We built the world's smallest snow fort. My dad taught us tactical snowball warfare, involving sneaking up on the opponent from behind the shed. The snow was too shallow for snow angels, it wasn't cold enough for the snowman to last. But the magic was there. My mum wrapped me in fleeces and flannel, we turned on the little gas fireplace in the living room. I sat in that old blue chair and the Christmas tree's lights flickered, mellow, in the corner. It was simple, I was warm, I was wrapped in the quilt of a quiet and gentle childhood, the doves were my friends, at night I could watch the stars, my sister lay in the bed beside mine, my parents were in the room next door. After we left England Christmas was never really the same. We started to travel, we were out in the bush over Christmas more often that not, the lights and trees and bells loose their sparkle. But sometimes I'm taken back to that living room, the Tweety blanket over my lap, red Ikea couches. Doves on the swing-set in the garden, the smell of ginger and cinnamon from the little Dutch pepernoten cookies, the refrain of Little Donkey forever engrained somewhere in the back of my mind. Little Donkey, carry Mary, safely on her way, they said. 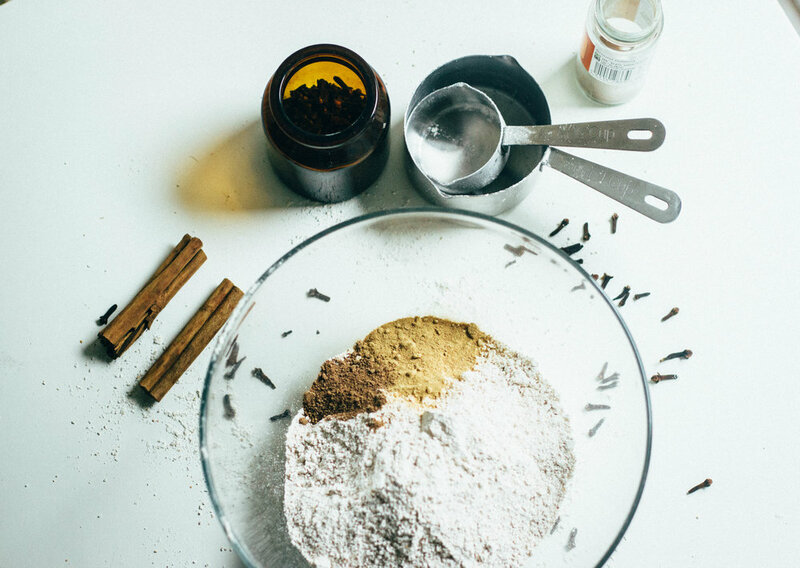 In a large bowl, whisk together the flour, spices, baking powder & soda, salt. Set aside. In a smaller bowl or liquid measuring cup, add the oil and the molasses, whisk till thick and combined. Add the sugar and continue whisking - it should be smooth, if your mix refuses to do this (more likely with coconut sugar) pop it in the microwave for a short burst or over very low heat. Once it's smooth (and cool) whisk in the egg thoroughly. Pour the wet mix into the dry mix and start to stir. It will be hard work, but resist the temptation to add water! (I did, then it was too wet and I had to mess around with more water, so this is proven). When you're relieved it's finally coming together, ensure it's all combined. Cut two large pieces of plastic wrap and divide the dough between them, shaping into two discs roughly 2 1/2cm (1 inch) thick. Wrap tightly in plastic and refrigerate till firm and cold - at least one hour, or overnight is nice for really complex flavours. The next day or once fully chilled, remove one piece of dough from the fridge and allow 5 or so minutes to come to room temperature. Line 2 cookie sheets and preheat the oven to 180'C, 350'C. Adjust two racks to the lower shelves of the oven. Lightly flour a flat surface and a rolling pin. Take the dough and gently roll it out, remember that einkorn, spelt etc are much lower in gluten than wheat so the dough will be more fragile. Check that it's not sticking to the surface but don't add too much flour since you don't want to dry out the dough. It should be under a centimetre thick - about 1/4 inch. If the dough isn't cooperating because it's too stiff and cold, allow it a few minutes to warm up. If it's very sticky, pop it in the fridge for a few minutes. 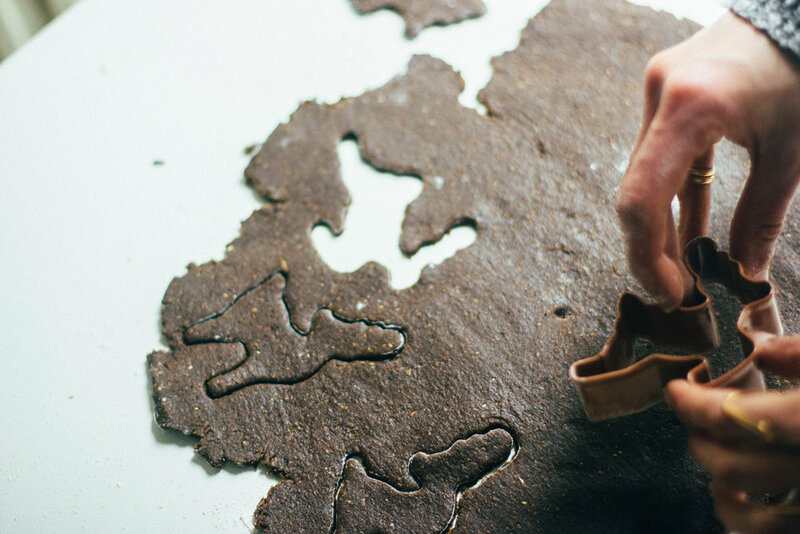 Once rolled, dip your cookie cutters of choice into some flours and cut away. Place on the baking sheets, they don't spread really, so don't need huge space. Re-roll your dough scraps, flour your surface, roll again and repeat with all the dough. You may need to rest the dough in the freezer for a few minutes as you sort the scraps, and you may notice it starts to dry out because of the added flour but it'll go a long way. Once all the cookies are cut, bake them for 10-12 minutes, till a shade or two darker and firm but not yet crisp, they will crisp as they cool. You may need to do this in batches depending on how many cookies are preparing at a time and how many pans you have. They'll keep in an airtight container for about 5 days and freeze well. If you have small kids around (or you're just an icing person) you could make a simple icing/glaze with powdered cane sugar, water and lemon juice and maybe give the caribou some eyes and things. 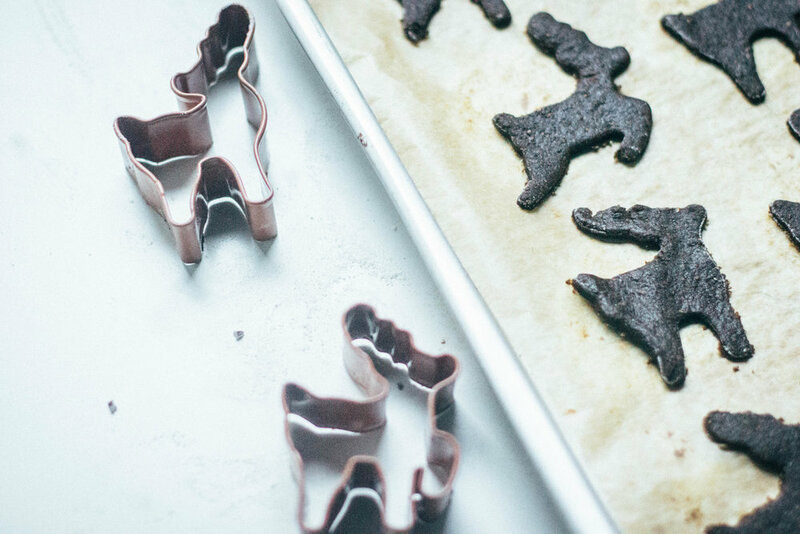 The number of cookies will depend on the size of your cutters. I used these adorable ones and I had something like 50 cookies, but they're quite small cutters. I'd say around 30 would be expected, it's a big batch but it's the season for sharing (and treats). I decided to only bake one disc because I knew I'd have a fair few cookies already (25) and fresh gingerbread is kind of unbeatable. If you'd like to do the same, just freeze a tightly wrapped disc and the day before you plan to bake it, allow it to sit in the fridge. Then just continue as normal and you've got fresh gingerbread to order. I specify this directly in the ingredients list but there are a few options for flours. I'd planned on tried/ trusted spelt flour but then some einkorn flour I'd ordered arrived and I couldn't resist. Einkorn in also an unrefined whole grain, similar to spelt it is an ancient relative of wheat (apparently the oldest strain of wheat) but is low in gluten, higher in protein than wheat and is a source of iron and vitamin B, which is quite special for a flour that's very easy to use. It's similar also to kamut, which would work here, but I understand that spelt it easier to find (and equally tasty and nutritious) but even easier to find is whole wheat flour, which will probably work too - you may just need to add a couple of teaspoons of water to the dough if it's very dry. 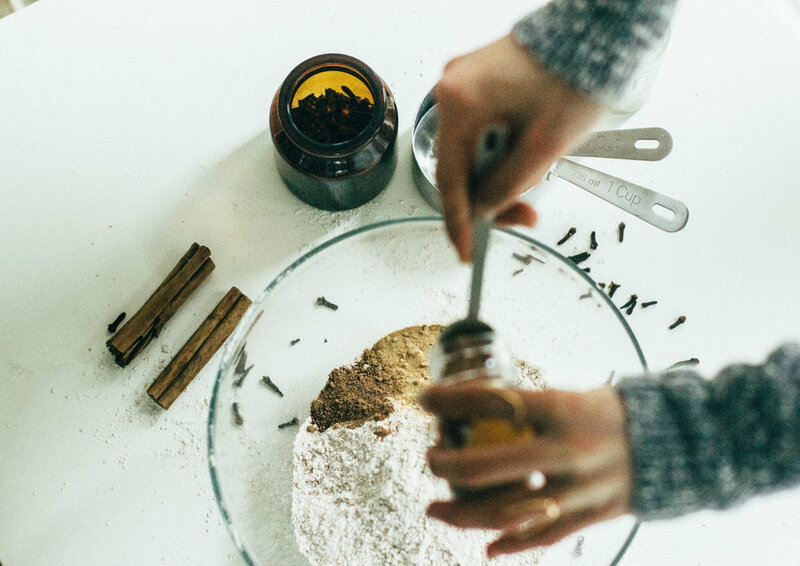 I just hope this gives you a way to have homemade & whole grain gingerbread this Christmas. PS. I have a really fun mini-post that should come out on Friday. 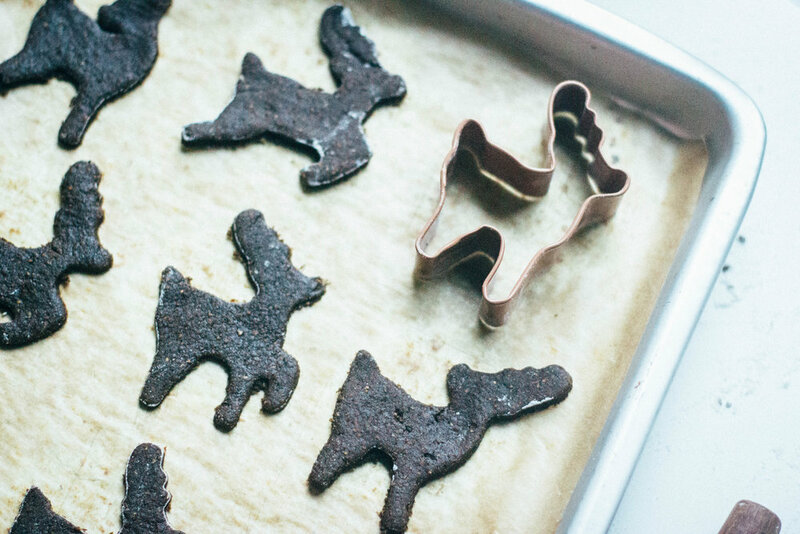 Pup friendly ginger oatmeal cookies, so no family member is left out of the fun this christmas. Keep an eye out for a newsletter! Also I'm leaving for our trip to India tomorrow, so the next post will be scheduled, but I'll be back with something special before Christmas. Gingerbread shall grace the subcontinent and a long haul flight.